Mail Orders: Please add $7 postage in Canada, $10 postage to USA destinations. In celebration of Canada’s sesquicentennial, Quinte Branch OGS wanted to acknowledge and honour our ancestors who were witnesses to and participants in the birth of our nation on July 1, 1867. Together, we have created a memorial historical directory of our ancestors who were residents in what is now present day Canada in the year of Confederation. Our intention was to make a fun project for our members by providing an opportunity to share their stories. The project was compiled from the contributions of 46 Branch members, former members, and friends of Quinte Branch, received from across Canada and from several States in the USA. The document contains 1,069 pages, and 1,236 family surnames are documented in the project. The file size is 421 MB. 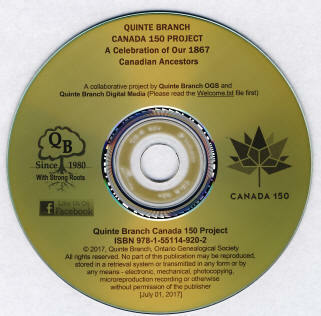 Copyright © 2006-2018, Quinte Branch, Ontario Genealogical Society.